Gammatex ®™ irradiation sterilisation indicators are Class 1 process indicators, manufactured in compliance with ISO 11140-1:2005 “Sterilization of health care products – Chemical indicators”. 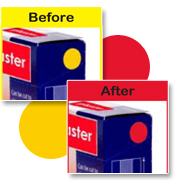 Gammatex ®™ gamma sterilization indicators undergo a simple yellow to red colour change when exposed to gamma radiation. They are used in the industry as qualitative process indicators for the gamma irradiation sterilisation process. Processed labels can also be retained as part of a quality control validation record. We are members of the iia global International Irradiation Association and are UKAS ISO 9001:2008 accredited.